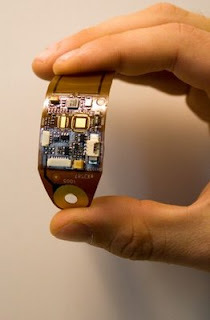 Electronic systems can now be embedded on conventional but flexible and inexpensive substrates. A new process, named ultra-thin chip package (UCTP), makes possible electronic systems as thin as 60 micrometers. It also opens the door to wearable medical devices that will be discreet and comfortable to wear. The new manufacturing process involves reducing chip thickness to 25 microns and embedding them in a flexible, ultra-thin chip package. After embedding, high-density integration of other components is achieved by mounting them above and below the embedded chip.